This post describes our experience working in Antarctica and accompanies our article in Nature Microbiology. For anyone making the journey to Antarctica one of the most overwhelming emotions that first hits you on arrival is the sheer isolation of the place. For scientists working in East Antarctica It takes approximately ten hours by military transport plane from the dry summer heat of the nearest non-polar landmass at Christchurch in New Zealand until you land on the sea ice off Ross Island and get your first glimpse of Scott Base, the kiwi research facility located at almost 78o South. The flight takes you more than 3,800 km over the Southern Ocean and it remains one of the most challenging routes for the highly trained pilots who sometimes have to “boomerang” their planes back to New Zealand if conditions are too dicey to allow a safe landing on the ice. This is very disheartening when you can see the Antarctic landscape from the window of the cargo hold but is a rite of passage for every seasoned researcher. It takes microorganisms considerably longer to make the same journey. Theoretical models predict it takes just over two weeks for microbe-sized particles to fly in atmospheric winds from New Zealand to Antarctica and this is near the upper limit of their predicted survival and residence time in air. This isolation makes Antarctica a great place to test hypotheses related to microbial biogeography, and in particular the role that transport limitation may play in determining dispersal outcomes in Antarctic soil. In our latest study published in Nature Microbiology we looked for evidence of inter-continental airborne transport limitation for bacteria and fungi which are the dominant microbes in Antarctic soil. We predicted deviation from a long-held assumption that microbial transport is a ubiquitous and neutral process, which arises largely from the famous “everything is everywhere” hypothesis postulated by Lourens Baas Becking in the 1930s. This notion has been challenged in recent years but supporting evidence has generally come from observations of source and sink communities rather than direct measurement of airborne microorganisms. Our study recovered massive bulk-phase air samples and combined this with high-throughput sequencing of rRNA genes to identify airborne bacteria and fungi. 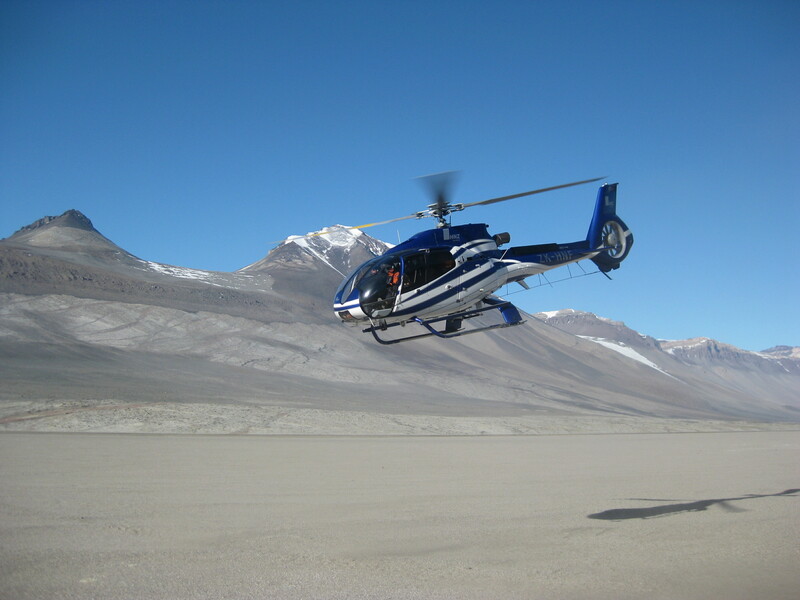 We targeted air at the near-surface as well as sampling high altitude air above the boundary layer for surface interactions using a helicopter. 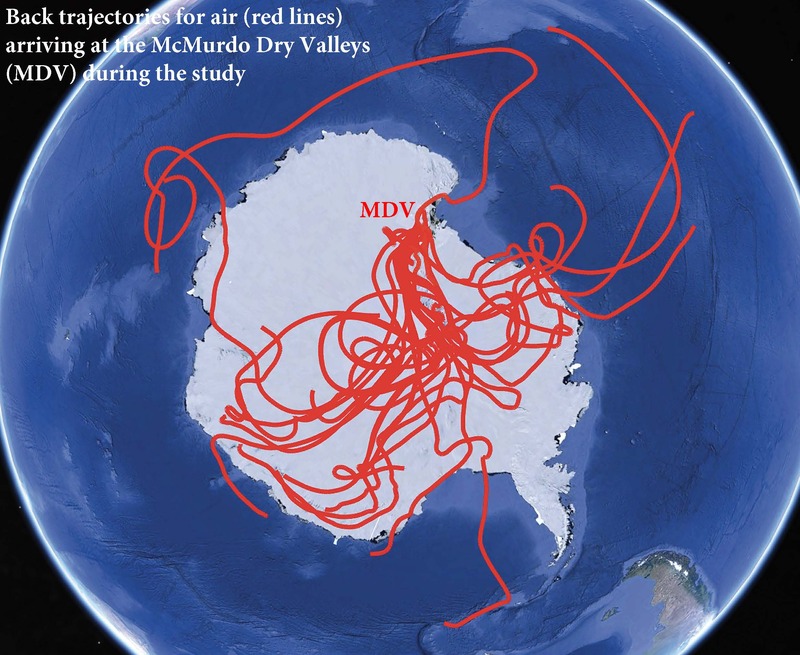 The findings showed that airborne microbial transport to the largest ice-free soil region, the McMurdo Dry Valleys, from wider regional pools was limited and that airborne recruitment of microorganisms to soil was largely a local process. We also found that bacterial and fungal groups displayed different levels of connectivity to regional pools in the aerosphere. These findings support the notion of airborne transport as a deterministic rather than a neutral process influencing microbial dispersal. Estimating microbial diversity in air is a very challenging task because the number of cells in a given volume is extremely low and so large samples volumes are required. Some studies have resorted to making indirect estimates by comparing diversity at source and sink locations but this reflects local interactions as well as airborne transport. Direct estimation of microorganisms in air is necessary to specifically address the role of airborne transport in dispersal outcomes. This requires high-volume air pumps to recover samples within biologically meaningful timescales, but they have generally been combined with recovery of cells by impaction onto membrane filters and this introduces major bias in diversity estimates due to physical damage. We developed a novel method for air sample recovery that minimised the problems associated with earlier approaches and allowed the first reliable estimates of airborne microbial diversity in Antarctica. We utilized a high-volume air pump capable of recovering over 300 litres of air per minute. This was coupled with a cyclone sampler that slowed down sampled air in stages and size-fractionated airborne particulate matter which included microbial cells. Sample recovery was achieved by impingement into a liquid medium thus greatly reducing cell damage during sample recovery compared to impaction onto solid filters. We used a DNA preservation solution as the impingement medium in order to minimise loss of sample signal and the liquid was maintained at constant temperature during sampling in the freezing Antarctic temperatures using a specially constructed heating jacket. The Antarctic fieldwork was planned during numerous chats with my postdoc and co-author Stephen Archer whilst in the cosy warmth of our laboratory. 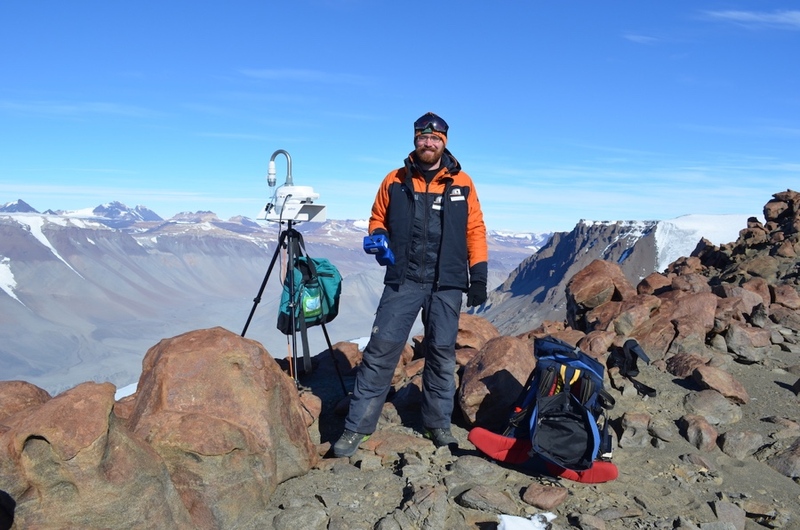 During an expedition lasting several weeks Stephen hiked to remote dry valleys locations in challenging terrain carrying over 30 kg of sampling equipment, as well as the survival gear needed to ensure he stayed alive should weather conditions deteriorate in the sub-zero temperatures. We never undertake fieldwork alone in Antarctica and Stephen was grateful to a number of other researchers in our group who took turns being his “buddy” during these long and demanding hikes. The challenging fieldwork conditions and technical demands of new method development made this a difficult project in several ways but it has been a thoroughly enjoyable journey and extremely rewarding to finally see the study come to fruition. We have now turned our attention to new questions arising from this work. Our current research is focused on how we might better quantify the exchange of microorganisms between the aerosphere and surface biomes across multiple spatial scales. We believe that greater understanding of this flux and how it is impacted by disturbance may have important implications for predicting ecosystem resilience in a changing world.